An inbound truck approaches the probe station at the Johnson Grain LLC rail terminal outside Waverly, IL. Here, a CompuWeigh SmartTruck RF reader will provide key data on the specific truck to the scalehouse operator. Photos by Ed Zdrojewski. When Johnson Grain LLC opened a new rail-loading terminal east of Waverly, IL in 2004 (217-435-2361) with a few up- right tanks and a 7,800-foot loop track alongside a Burlington Northern Santa Fe (BNSF) main line, volume was the name of the game. Four years later, volume is still the name of the game, and if anything, the scale is bigger than it was in 2004. To start with, some of the Prairie States best farmland can be found within a 25-mile radius of Johnson Grain. Given decent weather during the growing season, yields of 200 bushels of corn per acre or more are not uncommon. A sizeable percentage of that grain funnels through the Johnson Grain terminal, which has become one of the largest suppliers of corn to the Texas Panhandle, home of vast cattle feedlots. Johnson Grain supplies about 20% of the regions corn. The facility, in turn, has grown to handle the demand. Today, the site has 8.5 million bushels worth of grain storage, 7 million of which is in one of the largest covered flat storage buildings in the state. In addition, the company added a 2- million-bushel temporary storage ring in 2007. During the 2007 harvest, reports President Jay Johnson, the facility at times unloaded more than 900 semi-trucks per day, taking in roughly 850,000 bushels. Workers at Johnson Grain also loaded a pair of back-to- back BNSF 110-car shuttle trains in less than 27 hours. Johnson comments that handling this level of volume would not be possible without a high degree of automation throughout the facility. The purpose isn’t to reduce hours or eliminate employees, he says. We have found skilled labor locally for monitoring our operations, but we’ve had difficulty finding unskilled laborers, who can sometimes be unreliable. Automation reduces the need for the unskilled labor. 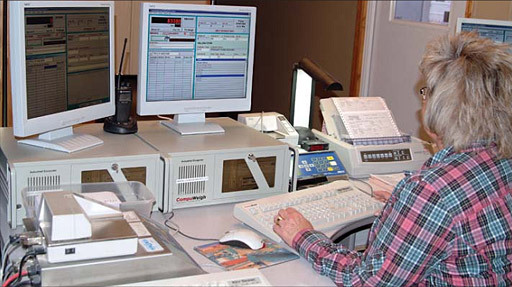 Right from the start in 2003, Johnson Grain has partnered with CompuWeigh Corp., Woodbury, CT (203-262-9400), for its automation solutions, although automation systems have been adopted incrementally over the years. We chose CompuWeigh because they were able to custom-design systems for our operation, with safety fea- tures built right in. We’ve been pleased with their sales and engineering staff and their knowledge of our industry. And CompuWeigh also offers a bulkweigher, which we’ve utilized from the day we opened. We chose CompuWeigh because they were able to custom-design systems for our operation, Johnson says, with safety features built right in. We’ve been pleased with their sales and engineering staff and their knowledge of our industry. And CompuWeigh also offers a bulk- weigher, which we’ve utilized from the day we opened. The next step in the automation process was to automate rail-loading operations. 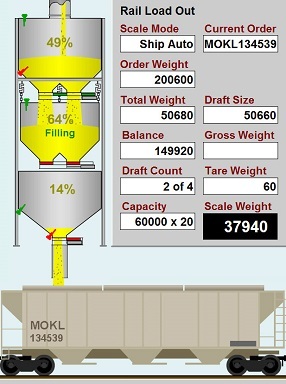 The bulk weigh loadout scale was placed under the control of a CompuWeigh GMS-4000 bulk weighing controller. Johnson Grain also installed a trackside CompuWeigh SmartRead railcar RF tag reader. This device reads data from rail industry RF tags mounted on the passing hopper cars and transmits the car number to the controller. The controller refers to its SmartCar database for cubic capacity and load limits. The most recent automation up- grade at the terminal was the installation in 2007 of a CompuWeigh SmartTruck unattended truck processing system linked to exist- ing inbound and outbound truck scales flanking the scalehouse at the terminal entrance. Inbound trucks first stop at a probe station about 330 feet north of the scalehouse on the terminal entrance drive. The scalehouse operator uses an overhead video camera to probe the truck with a newly-installed truck probe from Union Iron Works, Decatur, IL (800-333-5148). The probe sends a representative sample to the scalehouse for grading via pneumatic tube. Scale Operator Cindy Turner receives truck data and gross weight of an inbound truck at her workstation. At the same time, a SmartTruck RF reader reads data from a Johnson Grain-issued SmartCard tag supplied to the trucker. The tag contains a unique number that allows the Grain Management System (GMS) computer to display the most recent contracts that this truck has brought in. The operator selects the appropriate contract, and all the information is shown automatically on the computer screen. Once probing is completed, and the probe arm is safely out of the way, a CompuWeigh SmartView message board tells the driver to proceed to the inbound scale on the west side of the scalehouse. At the same time, the operator is grading the sample. 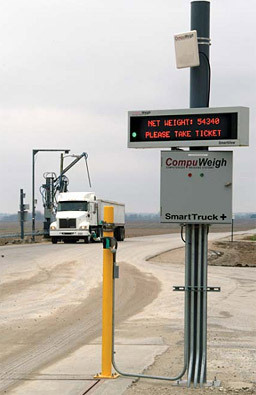 Once the truck comes to a complete stop on the scale, it is weighed, and another SmartView message board displays the loaded vehicle’s gross weight, which directs the driver to proceed to the appropriate receiving pit. After the driver deposits the load into the pit, he or she returns to the scalehouse and stops on the outbound scale on the east side of the building. As the tare weight is taken, the driver receives the scale ticket from a CompuWeigh OTP-4000 printer mounted at window level alongside the scale. At this point, the trucker is free to leave the property. The entire system increases our efficiency, since the driver never has to come into the office to receive the ticket, Johnson says.